Human partnership or relationship, be it spouse, husband and wife, spiritual friends or simply two person happen to know each other are like mirrors. Each human being is the Adam or the Eve anew. And each journey together is the same journey of joy and sorrow, separation and union. But in this dramatic journey the functionality as mirror to each other hold a key. When it comes to a lasting, deepening relationship the function as mirror becomes much more significant. In order to become true spiritual partners, both better never forget their roles as mirror to each other. And what is the purpose of a mirror but to reflect without judgement, without self-imposing, without the bending and distortion that comes from ego. Just as a beautiful mirror reflect the object faithfully, so must each partner do. There is much to learn simply from the action of a mirror. Much to learn from the unparallel patience of the mirror, from being faithful and the state of non-discrimination between black and while, between what is apparently right or wrong. God wanted to be known, so God brought forth the creation so that like a mirror the whole of creation can behold the Infinite Manifestation of God, the Face of God. Wheresoever you turn is He! Just like a boundless mirror the whole cosmos expands and stretch towards infinity. God wanted Adam to know himself, so God created Eve, as his partner, as his comforter and companion. Our eyes can not see ourselves without a mirror, our self can not realize its values without the other. Our life remain unnourished without the other. Partnership that seeks spiritual fulfillment better reflect faithfully the Divine qualities embedded in each. This being human is nothing but to grow towards our Divine qualities that we are all gifted with, that we all carry within us. BUT when it comes to reflecting as mirror, its not only the Divine qualities but also the undeniable human imperfections we also have to deal with. We are falliable, we are limited, we have imperfections. The mirror can not deny the imperfections, but must reflect back that too. The real challenge lies in how much non-judgemental, how much compassionate, how much patience do we show when we reflect back the shadow of the other. No matter what and how sweet the relationship is, the dynamics of personality, psychology of self and interplay of events will bring this shadow for sure and as mirror each has to be a witness of that, today or tomorrow. Sadly enough many relationship do break down at that point. Sadly enough many beautiful mirror comes to a point when it collect rust and dust. 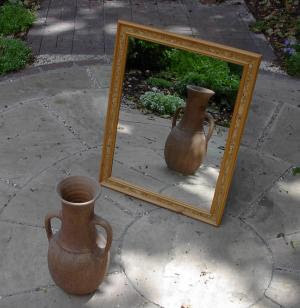 When the mirror fail to perform its dual task of beholding not only the beauty but also the ugly, it breaks down. It might live happy with the beauty alone, but when it comes to non-beauty it becomes utterly confused and afraid. The mystical paradox is this: although the Grand Oneness beholds all as the fabric, there is duality embedded in this creation, everything do work on duality principles in this world 'of mind and perception'. The relationship that live only under the pretext that everything is rosy and beautiful must come to a shock oneday if it keep neglecting the fact that shadow, imperfections are also there and will come to reflect at some point. The question is, what happens when the mirror breaks down? What if the mirror fails? Then the bond loses its magic temporarily (often might lead to (temporal) permanence), clouds of darkness, sorrow, dissapointment, depression, sadness, negativity comes and overshadow it. Watch out for ego that make it happen and put it under veil. Then the whole purpose of coming togther in a partnership gets lost. Like a pendulum, instead of coming closer and closer it starts to move away and further away. As a mirror - relationship better not forget about the shadow and its role that it must have to reflect back that too and in doing so it must help the other to grow. Shadows and imperfections are there to convert into light and perfection. And reflecting that faithfully, pointing out that imperfection is the first step to correct it. Mutual acknowledgement of each others shadow and accepting it, and help each other in working on it is the key. May the mirror instead of breaking down at shadow, be the beackon and hint to realize perfection. "(...) What is the mirror of being? as a gift. Any other present is foolish. that's when the real making begins. That's what art and craft are. A tailor needs a torn garment to practice his expertise. so they can be used for fine carpentry. Your defects are the ways that glory gets manifested. begins to gallop on the way. (...)"